1.This is to inform corps members registered under the 2014 Batch 'B' Stream II, who could not do the three- week orientation programme in August 2014 as a result of the Ebola scare, that arrangements have been concluded for them to participate in the forthcoming Batch ‘C’ Orientation programme scheduled to hold nationwide from 4-24 November, 2014. 3. Consequently, the affected Corps members are to report to the orientation camps in their current states of deployment on the 4th of November, 2014 unfailingly for the commencement of the three-week orientation course. 4. Please be informed that the Orientation Course is mandatory and not optional. You are therefore advised to proceed to the camp with the kits (NYSC uniforms) issued to you earlier as no other kit item will be issued. 5. You are to present your identity cards before admission into the camps. Details of the programme will be communicated by your NYSC State Coordinators. 6. All corps members who are billed to participate in the Batch 2014 orientation exercise are advised to check the details of camp venues and locations on the NYSC Website: portal.nvsc.gov.ng,. 7. Please note that the following States; Abia, Akwa Ibom, Cross River, Delta, Ekiti, FCT, Katsina, Kwara, Lagos, Niger, Ogun, Osun, Oyo, Rivers, and Sokoto States will in addition, host Stream II 2014 Batch ‘C’ Orientation as will be indicated in the call-up letters of the affected corps members from 26 November to 15 December 2014. 8. Corp members posted to Gombe will have their orientation in Niger state forthe 2"* stream starting from the 26* November to 15* December 2014. All affected corps members to note please. 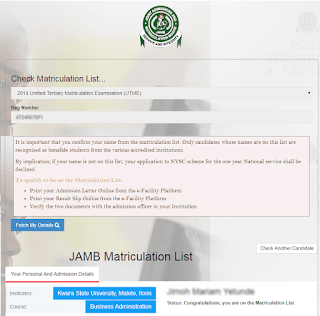 Commencement of Registration: Tuesday, 4th November, 2014. Cut-off date for Registration: 12 midnight, Wednesday 5th November, 2014. Swearing-in ceremony: Thursday, 6th November, 2014. Official closing ceremony: Monday, 24"'November, 2014. Commencement of Registration: Wednesday, 26th November, 2014. Swearing-in ceremony: Monday, lst December, 2014. Official closing ceremony: Monday, 15th December, 2014. 10. The Director General Brig Gen JB Olawumi FSS MSS psc (+) fdc wishes all prospective corps members journey mercies to their respective camps and a memorable Orientation course.